At The House Number Lab, we've researched and painstakingly selected only the best historically accurate and period-inspired fonts, because the details matter. Our installation method ensures a professional look. Everything is included with your order. The House Number Lab was started to elevate the status of house numbers to an appropriate place in the pantheon of fine home building. 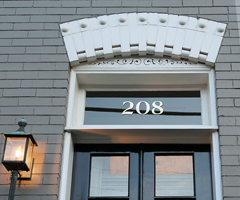 Focusing on gold leaf transom house numbers was our inspiration as we struggled to find address numbers that were artful, historically accurate and customized for our need. Taking great pride in our design, craftsmanship and customer service, we’ve addressed beloved homes across America’s finest neighborhoods. We've researched and painstakingly selected only the best and historically accurate fonts. The details matter. Our installation method ensures a professional look. Everything is included with your order. Tall or small, bright or subtle - we've got great choices. Select your options on the product pages to check pricing and get started!